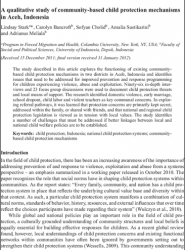 The study described in this article, published in Vulnerable Children and Youth Studies, explores the functioning of existing community-based child protection mechanisms in two districts in Aceh, Indonesia and identifies issues that need to be addressed for improved prevention and response programming for children experiencing violence, abuse and exploitation. Ninety-six in-depth interviews and 23 focus group discussions were used to document child protection threats and local means of support. The research identified domestic violence, early marriage, school dropout, child labor and violent teachers as key communal concerns. In exploring referral pathways, it was learned that protection concerns are primarily kept secret, addressed within the family, or shared with friends, and that national and regional child protection legislation is viewed as in tension with local values. The study identifies a number of challenges that must be addressed if better linkages between local and national child welfare policies are to be established.